Providing you the best range of pneumatic automation systems with effective & timely delivery. Low investments, compatibility with other automation technologies such as P.L.C.s, simple maintenance demands, inexhaustible air as its working medium are some of the unique features of a pneumatic Automation System, making it the ready choice in a wide variety of automation needs, be it textile machinery, machine tools, packaging and printing machines, assembly lines, material handling etc. 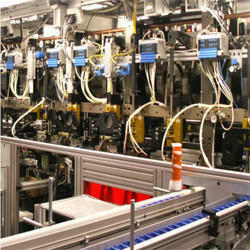 The pneumatic system provides a wide range of automation, offering enormous savings in time, energy and costs. For several decades Schrader has been engaged in offering pneumatic Systems for a wide section of the industry. Equipped with a highly qualified and experienced team and computer-aided design tools, we undertake to provide automation solutions from design to execution. Valve stands for steel mills. Systems for tire processing machinery. Liquid and solid filling and packing equipment.